Entering Erin Hanson’s studio in San Diego, California, is a surprising experience- coming off the street of an industrial area of the city, you feel a sense of respite once you are in the presence of her landscape oil paintings. Her style continues the legacy of early European modern art, combining influences from Impressionism and Expressionism (her work has been characterized as “Open-Impressionism”). Her vivid landscapes picture the terrain of Utah, Nevada, Arizona, and California, and reflect her deep connection to the outdoors as an avid rock climber and backpacker. After a period of experimentation with different artistic materials, styles, and subjects, Hanson discovered her inspiration in nature while climbing in the Red Rock Canyon of Las Vegas. Her particular style is marked by gestural, broad brushstrokes and heavy impasto, which makes for a heavily built up surface that is reminiscent of 19th century Impressionism. Her palette has evolved in the last few years from a more muted, cooler palette, to a vivid one of bright pinks, greens, purples, yellows, and blues that is reminiscent of the early 20th century German Expressionist palettes. Like the Expressionists, hers is a less strictly naturalistic use of color that leans towards the symbolic. Her recent series of paintings on the California landscape of Paso Robles clearly demonstrates this color sensibility and sense of greater abstraction. One of the hallmarks of her style is her treatment of light; she demonstrates its crystalline, dappled quality and changing appearance filtered through the branches and leaves of her trees through a mosaic-like application of paint. Recent canvases also evidence that Hanson has also moved from a more literal approach of form and composition to one that is more highly abstracted and more highly emotional. Recent canvases like The Path have the moving, vibrating character of a Van Gogh landscape with the bright, saturated colors of an early German Expressionist landscape, such as those by Karl Schmidt-Rotluff. Her undulating landscapes seem to pulsate with a sense of quiet, inviting life that is both serene and exciting, and this sense of movement in her work seems to equally reflect the reality of her chosen outdoor scenes and the inner attachment that Hanson feels to these sites. This makes for landscapes like Purple Dawn and Spring Fling that are sort of fusion of a faithful reproduction of an outdoor scene and an emotional reflection on her favorite sites. Hanson truly makes her vibrant landscapes of the western United States come alive. RACHEL BARTH holds an MA in art history from the University of Oregon, Class of 2013. She specialized in modern art and the history of photography. Rachel is can now be found working as a research assistant at the Getty Research Institute in Los Angeles and an adjunct professor in the art department at Whittier College. At first glance, Erin Hanson seems to be a study in contradictions. Although she grew up in the city of Los Angeles, her source of inspiration for her paintings are the broad vistas of southwestern natural landscapes. She took a break from painting to obtain a degree in Bioengineering, and then went right back to painting. Yet, on a closer look, there is a particular harmony to be found within those opposites which serves well to help define her body of work. Her richly colored and textured paintings, which depict the awe-inspiring scenic landscapes of the American Southwest, show a mastery of form and composition, with colors as vibrant and lavish as stained glass. Magnificent interplays of light and shadow lend additional depth and texture to her paintings. 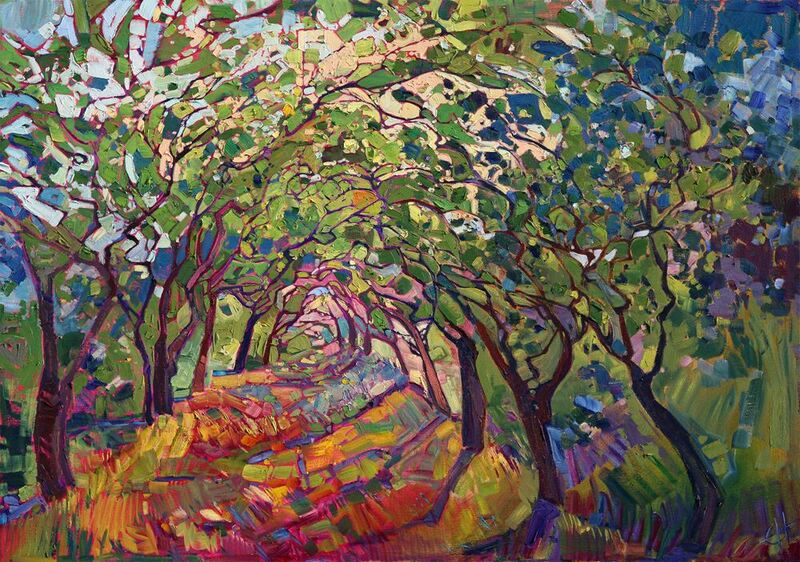 Although she has been compared to Impressionist greats including the likes of Van Gogh, Monet and Cezanne, with a bold, rich color palette reminiscent of the likes of Matisse and Gauguin, Erin Hanson's style is uniquely her own. Erin's technique betrays a deep technical mastery of color, which she has spent years studying. Because it is also remarkable in its own right, it is worthy of more than a passing comment. Having sketched out her scene in ultramarine blue, paying due attention to creating a harmonious balance of form and composition, she then pre-mixes her color palette. She limits the number of colors she uses to a rather spartan level, usually not extending it beyond four colors, with minimal blending. She is no shrinking violet when it comes to laying the paint on the canvas. Using a wet-on-wet technique, and without layering or diluting her brush strokes with turpentine or other washes, her application of the paint reveals an extraordinary fearlessness: using a thickly loaded brush and bold impasto strokes, she goes over the canvas only once. This type of sublime confidence expressed can only come as a result of years of intense and ongoing study of color and form; yet in spite of this, anyone who has ever picked up a paint brush can't help but appreciate the bravery and self-reliance it actually takes as an artist to trust oneself to get it right the first time, every time. And somehow, she always does get it right the first time. Her thick, skillful brush strokes reveal a purity of color and form and expression; they are the hallmark of a true artist who has learned to communicate her vision directly to the canvas. There is a rarefied integrity of character to be found in Erin's paintings that seems to illuminate them from within. In her own words, Erin describes her style as “Open Impressionism”, in homage to the late 19th-century plein air Impressionists, but also with a nod to the modernist, more subjective Expressionist movement of the early 20th century. Although her landscapes are instantly recognizable as such, she imbues them with an emotional, rather than representational, view. Her colors literally vibrate with intensity, and manage to convey the lush, sensual freedom of the open air while somehow also instilling the viewer with an underlying sense of harmony and balance. There is a remarkable synchronicity between freedom and discipline to be found in the sanctuary of her vivid landscapes, which is not easily defined. One does not merely look at her paintings; rather, one experiences them. ANJA WULF is a copywriter, ghostwriter, editor, and poet. Raised in a trilingual environment by European parents, Anja's first artistic passion was the classical piano, at which she excelled as a child, playing in numerous international solo performances in her first decade of life. 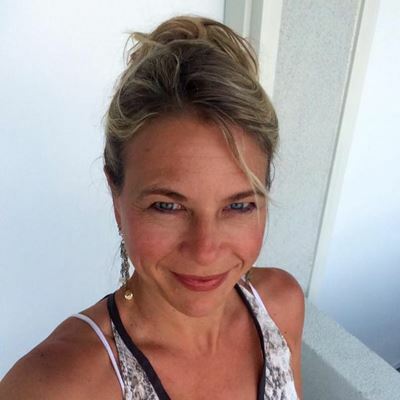 A world traveler and collector of a substantial mixed media art collection, from indigenous antique textiles to postmodern paintings, Anja has been a hotel art curator and is a self-described aficionado of “all things beautiful”. She holds a degree in Cultural Anthropology from the University of Chicago, which informs her own work as well as her appreciation and ongoing study of fine arts across the globe.